This image of the geyser-spewing Saturn moon Enceladus was taken on Oct. 5, 2008 by NASA’s Cassini spacecraft. A decade from now, NASA probes could be on their way to explore two potentially life-supporting alien worlds. The agency already plans to launch a spacecraft toward the Jupiter moon Europa in the early to mid-2020s, and it's mulling a mission to the Saturn satellite Enceladus that would lift off by the end of 2021. Many astrobiologists regard Europa and Enceladus, which are both thought to harbor oceans of liquid water beneath their icy shells, as the solar system's two best bets to host alien life. NASA is expected to cull the original Discovery applicant pool to a handful of finalists next month, then select the overall winner around September 2016. The people behind ELF — which, as its name suggests, would search for signs of biological activity on Enceladus — believe they've put forward a strong contender. "We think we have the highest chance of success of getting an indicator of [alien] life for really any mission at this point," ELF concept principal investigator Jonathan Lunine, of Cornell University, told Space.com. More than 100 geysers blast water ice, organic molecules and other material into space from the south polar region of the Saturn moon Enceladus. In 2005, NASA's Saturn-orbiting Cassini spacecraft spotted geysers of water ice, salts, carbon-containing organics and other molecules erupting from the south polar region of the 310-mile-wide (500 kilometers) Enceladus. These jets, which are powered by Saturn's intense gravitational pull, merge to form a plume that reaches far out into space. Indeed, Enceladus supplies the bulk of the material making up Saturn's wide E-ring. That's just what ELF intends to do. Cassini has flown through the plume multiple times, but that spacecraft isn't equipped to search for life. ELF, on the other hand, would probe the habitability of Enceladus' ocean and hunt for evidence of biological activity. ELF would carry two mass spectrometers; one would be optimized to study gaseous plume molecules, whereas the other would focus on solid grains, Lunine said. These instruments would study amino acids (the building blocks of proteins), fatty acids, methane and other molecules, allowing mission scientists to perform three separate tests for life. "Positive results for all three would strongly argue for life within Enceladus," the ELF team wrote in a paper presented at the 46th Lunar and Planetary Science Conference, which was held in March in The Woodlands, Texas. A fourth life test should also be possible, Lunine said. Current ELF plans call for including a technology-demonstration instrument designed to determine the chirality, or "handedness," of amino acids. All Earth life uses left-handed amino acids rather than right-handed ones; a similar preference found in an extraterrestrial sample would be a strong indication of alien life, astrobiologists say. If NASA chooses ELF, the mission will by ready by 2020 and could launch that year or in 2021, Lunine said. The baseline concept calls for ELF to launch aboard a United Launch Alliance Atlas V rocket and endure a 9.5-year-long journey to Saturn (though the trip would be much shorter if NASA's Space Launch System megarocket, which is currently in development, were used). ELF would enter orbit around Saturn, then fly through Enceladus' plume eight to 10 times over the course of three years. These sampling sojourns would bring the robotic probe within about 31 miles (50 kilometers) of Enceladus' surface, Lunine said. ELF is a logical follow-on from Cassini and leverages much of the older mission's heritage, he added. But the two are far from carbon copies. The school-bus-size Cassini, for example, cost $3.2 billion and features 12 onboard instruments. Cassini is also powered by three radioisotope thermoelectric generators (RTGs), which convert the heat of plutonium-238's radioactive decay into electricity. But ELF would be solar-powered, because NASA, concerned about its dwindling stockpile of plutonium-238, prohibited the use of nuclear fuel for this Discovery mission. No solar-powered spacecraft has ever operated as far away as Saturn, where sunlight is considerably weaker than it is here on Earth. NASA's Juno probe, in fact, will make history as the first solar-powered Jupiter spacecraft when it reaches the solar system's largest planet next July. But Lunine is confident that solar energy will do the job for ELF. "We found that this was a very feasible way to conduct the mission," he said, declining to provide technical details because the Discovery competition is ongoing. Demonstrating the utility of solar power at Saturn is an important goal in itself, Lunine added, because nuclear fuel will always be in relatively short supply and therefore reserved for future missions that cannot do without it. Examples of plutonium-dependent missions include efforts to explore the surface or atmosphere of Saturn's huge, haze-shrouded moon Titan or probes that journey to extremely faraway destinations such as Neptune. "We want to push the boundaries for solar power so that, for missions in orbit around Saturn, we don't need to use that valuable inventory of radioisotopic fuel that's going to be needed for these other missions," Lunine said. NASA's upcoming Europa mission, which does not have an official name at the moment, will also make use of solar power. The roughly $2 billion mission will be based in orbit around Jupiter but will make 45 flybys of the 1,900-mile-wide (3,100 km) Europa over the course of two and a half years or so. Lunine and his group aren't the only scientists interested in exploring Enceladus. For example, another team has been working on a idea called Journey to Enceladus and Titan (JET), which would assess the life-supporting potential of both moons. And another research group is developing a mission concept called Life Investigation for Enceladus (LIFE), which would return samples from the icy satellite's plume back to Earth for analysis. Neither JET nor LIFE was proposed as part of the most recent Discovery call. The LIFE team dropped out of the running primarily because it viewed nuclear power as more or less a necessity for a Saturn mission, leader Peter Tsou told Space.com. But Tsou and his colleagues continue to work on LIFE and hope to submit the concept during a future NASA call for proposals. 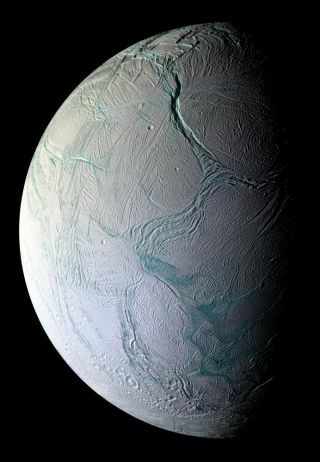 Enceladus is more than worthy of the attention it's currently getting, said Tsou, who's based at Sample Exploration Systems in La Canada, California. A life-hunting mission to the geyser-spewing moon would deliver impressive "bang for the buck" astrobiologically, allowing humanity to take a solid crack at perhaps the biggest mystery facing humanity, he said. "This 'are we alone' question — potentially we can shed tremendous light on it in a single mission," Tsou said.